MUSCAT- OMAN AIR, de explosief groeiende 4de luchtvaartmaatschappij uit de Golf staatjes, geleid door voormalig commercieel directeur van de KLM Paul Gregorowitsch, zet de aanval op Europa voort. Nu met de introductie van een tweede dagelijkse vlucht naar Londen. Paul Gregorowitsch die ook Martinair en Air Berlin leidde, gaat met een uitvoerige verklaring in op de plannen van zijn maatschappij. Oman Air is naast Emirates, Etihad en Qatar Airways nu al de 4de maatschappij uit het Midden Oosten die succesvol de wereld verovert. Overigend sloot Oman Air onlangs een ferm contract met KLM voor het technisch onderhoud van haar hypermoderne vloot. Hieronder het officiele persbericht over de plannen van Oman Air. Oman Air is set to launch a second service between Muscat and London Heathrow from Tuesday 12th April 2016. The new service will complement Oman Air’s existing daily, non-stop and direct service between the two capitals. The service is being launched in response to overwhelming demand from air travellers for flights between Muscat and London, and from London to onward destinations in the Middle East and Asia. Bookings for the new service are now available online at www.omanair.com, or through local travel agents. “We are delighted to be launching a second daily frequency between Muscat and London. The popularity of Muscat as a destination for UK travellers has never been greater. Furthermore, the longstanding links between the UK and Oman ensure that London remains one of the most popular destinations for Omani travellers. The existing service departs Muscat at 14.00 and arrives at Heathrow Terminal 3 at 18.20. Return flights depart Heathrow Terminal 3 at 20.15 and arrives in Muscat the following morning at 7.35. The new service will fly through the night, departing Muscat at 01.25 and arriving in London Heathrow Terminal 4 at 06.30. Return flights will depart Heathrow Terminal 4 at 08.30 and arrive in Muscat at 18.55. All timings quoted are local. “Our customers have expressed a strong desire for a second frequency into London and we are very pleased to be meeting that demand with this new service. Whilst our existing service operates from Terminal 3 at Heathrow, the new service will operate from Terminal 4. Oman Air’s first service to London was launched in 2007 and was, alongside Bangkok, one of the airline’s first two intercontinental destinations. Regarded as a flagship route, the Muscat to London service has experienced rapid growth and is regularly sold out in each of its three classes. The second frequency will enable many thousands more customers a year to experience Oman Air’s award-winning products and services, and its warm Omani hospitality. The Muscat to London route is operated with Airbus A330-300s, each of which offers outstanding onboard comfort and amenity. Spacious, fully lie-flat seats – each with direct aisle access – are offered in both First Class and Business Class, whilst comfortable, fully adjustable seats are fitted in a 2-4-2 configuration in Economy Class. Mobile phone and WiFi connectivity – pioneered by Oman Air in 2010 on the Muscat-London route – is available throughout each aircraft. In addition, a la carte cuisine is offered in every class, with First Class dining on the Muscat-London service being singled out for praise in the Reader’s Choice category of Saveur magazine’s Culinary Travel Awards 2014. 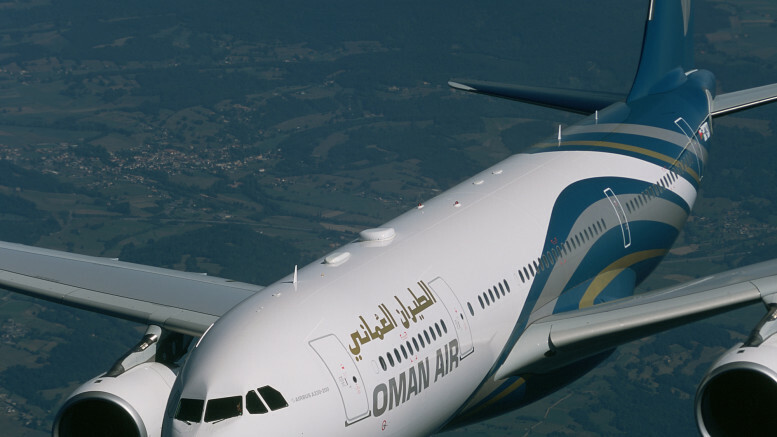 Oman Air is currently engaged in a major fleet expansion programme, which will see the airline’s fleet increase in size to 70 aircraft by 2020. The fleet size currently stands at 40 aircraft, which include Oman Air’s first Boeing 787 Dreamliners. These innovative and already-iconic aircraft are likely to be introduced to the London service over the next two years. In parallel with the fleet expansion, a range of exciting new destinations is being introduced to the airline’s network, frequencies are being increased on established routes – such as the Muscat to London service, and connections at Muscat International Airport are being improved.